There are times when only a dog can bring the security you need. A well trained NASDU handler with his dog can be far more productive and effective in the situations where one guard cannot cover the area or work within the budget and in these cases, a Security Dog team can effectively replace up to 3 static Security Officers. Dog Teams are the best visible deterrent and will compliment any security contract. Security dog units provide highly effective security in cases where a lone security officer would be outnumbered. 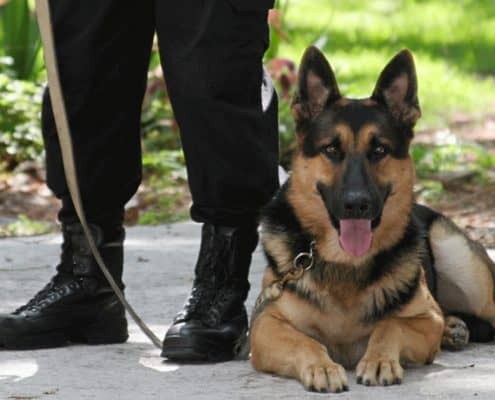 In addition to ensuring efficient security, experienced security Dog Handlers have the ability to replace multiple Security officers, so also offer a very cost-effective security alternative. Dogs have an incredible sense of hearing and a powerful sense of smell. The ears will detect any incursion on the protected area, the nose will detect any change in normality and the bark will deter. This enables them to detect disturbances from a long distance, and well before any person or high tech alarm system. Alarm systems have their place and are useful in indicating a disturbance, but they cannot act upon it. Equally, camera systems record what is occurring, but this doesn’t help if criminals use a disguise. Even a monitored system can experience a time lag if you’re at the response of the police who have limited resources – plus, the crime has already taken place. With an Advance Guarding Dog Handler, we can help you prevent the crime from occurring in the first place. Our Security Dog Officers operate from high profile, specific design, sign written vehicles which when seen on site, reduces the risk of criminals targeting your property. Thorough on-going assessments and training ensures that at Advance Guarding we supply Dog Teams of the highest quality that can interact with our customers and provide a first class service. The presence, visibility and effectiveness of static Security Officers is enhanced if those specialists are professional Dog Handlers, using the animal’s enhanced ability to detect trespassers or intruders through their keen sight, astonishing sense of smell and their sharp hearing. Very often, the Dog Handler will be alerted to unexpected activity by his canine partner long before they can be seen or even picked up on surveillance systems.